Life of a Catholic Librarian: Come talk to me on Twitter! I wrote a few months ago about my budding love affair with Twitter, back around the time of the papal conclave. I like it much better than Facebook in many ways. Facebook, for me, is where I go to keep up with family and friends that I don't get to see as often as I'd like, and where I keep in touch with my dance community on a regular basis. But I don't post there much anymore except photos. I find that I don't enjoy the dialogue that results, most of the time. But on Twitter that just doesn't apply. Everything is much more informal. Around the Conclave, I found myself checking in a lot, because it was so easy to connect with other Catholics talking about it. I like how you can follow people so easily on Twitter, people that you don't know at all but you share mutual interests. There are no hurt feelings surrounding follows or unfollows, it's all a big free-for-all. I kind of love it. And so since then, I have found myself logging in everyday and checking in on Twitter. I also post on there, daily. I'm learning all sorts of newfangled things about hashtags, retweets, and interacting with people on there. Although my following is still very small, over the course of the past several weeks I have gained some followers, including Fr. Frank Pavone of Priests for Life (I about peed my pants when I saw that one, I was so excited #nerdCatholic). So, today I made the decision that I'm really enjoying Twitter and I want to be able to interact with people more on there. 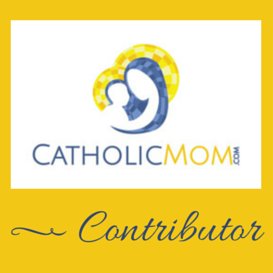 Other Catholics, dancers, knitters, moms, all interested parties. I've started following more people and I've "met" some people that way. We're getting there. So...come talk to me! I really want my presence on Twitter to be not just me taking in information from other people, but actually interacting with those that care about the same things that I do. If you've never used Twitter, come check it out. You may like it.